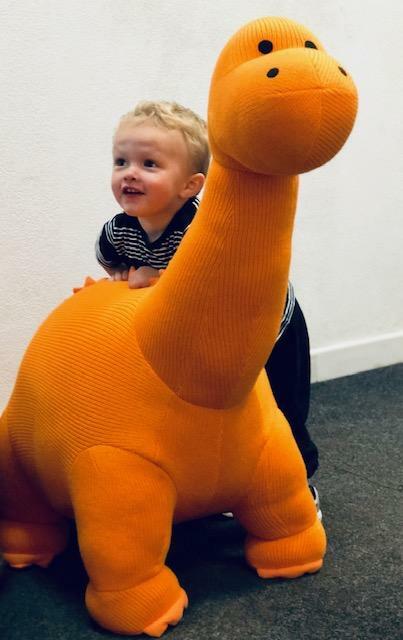 This giant orange knitted diplodocus dinosaur toy is sure to be a hit with any dinosaur mad boy or girl. This giant version of our diplodocus dinosaur would make a strong statement in any bedroom or nursery and would make a very special and unique gift. If you are looking for unusual and special gift ideas for kids that will make an impact, you have come to the right place! Please note that if our Giant Dinosaur Toys are showing as out of stock, they are available for special order - please email or phone us to check on delivery time.